The Norwegian company Stoke specialise in making innovative products to suit the needs of young infants. They supply all kinds of equipment related to babies throughout the UK and they have grown to become a popular brand amongst young parents. So far they have launched one changing table which has become very sought after. What features does this baby changing table have? The Stoke changing table is made from solid beech and has a natural finish, so it has both longevity and looks very elegant. It would not stand out in a room filled with similar wooden furniture. It is constructed over three levels. The top level has a space for a changing mat which can be slid in between two wooden bars which guarantees a safe space to change the baby. This level can also be adjusted up or down depending on how tall the parent is, which ensures maximum comfort. The second and third levels are used as storage space. The stoke changing table is sold with two wide and deep plastic containers which can be placed in these levels, and objects relating to changing the baby, plus toys and towels can be kept in them. There are also additional compartments on the side which can be attached or taken off. They are placed next to the top level. In them, things like nappies and lotions can be kept so they are on hand for when the toddler is being changed. The beauty of the Stoke changing table is that once the baby has outgrown it, a desk kit can be purchased enabling the parent to use the changing table as a desk. The compartments on the side can be used to store desk related materials in, whilst the top level is lowered so the individual can find it easy to work on. There is also the option of enlarging the desk so more objects can fit on. 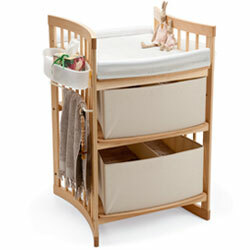 The weight of the changing table is 24 kg, so it can be moved around comfortably. Its height can be adjusted up to 105 cm. When cleaning the changing table, a damp cloth to remove dirt from the wood, and it is advisable to use nothing more than a natural detergent should the dirt remain, or else the wood might get damaged. There are stores throughout the UK which stock the Stoke changing table. It is possible to find a store in every city and urban area, so you will never have to travel far to find one. They are usually stocked in baby boutiques which are small independent stores which sell stylish baby products. All Stoke products come with a seven year warranty, and most baby boutiques which stock this item should be able to deliver it to your home.